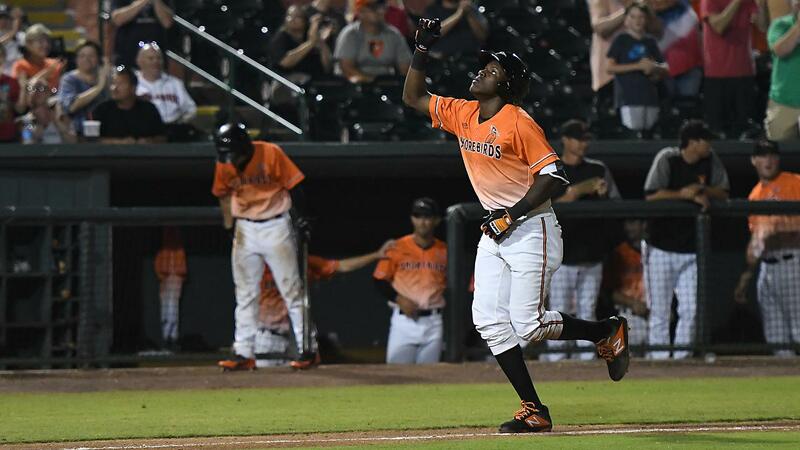 SALISBURY, MD - Jean Carlos Encarnacion belted a walkoff grand slam in the bottom of the ninth, and the Delmarva Shorebirds turned potential infamy into one of the more unlikely wins in franchise history, stunning the Lakewood BlueClaws 7-5 on Saturday night at Arthur W. Perdue Stadium. Lakewood made a pitching change and brought in Robinson Martinez, who got Andrew Fregia to pop out to second on the first pitch for the second out. Up came Nick Horvath, who had the first pitch graze the back of his batting helmet. Cadyn Grenier followed with a double that split the gap in left center, scoring both Breazeale and Horvath to get the Shorebirds within 5-3. The Shorebirds had a prime opportunity to get back into the game in the bottom of the first. Grenier, Neustrom, and Hall all drew walks to load the bases with nobody out. But Encarnacion was caught looking, Curran popped out, and Robertson fouled out to end the threat. Encarnacion's slam was his second home run of the season and the first Delmarva grand slam since Ryan Ripken did it on May 30, 2018 at Kannapolis. Grenier added a walk to his two-run double, and Hall walked three times before the crucial HBP. Delmarva finished with just three hits on the night to Lakewood's 12. Matos, Pelletier, Gutierrez, and Garcia each finished with two hits for the BlueClaws and combined for all five RBIs. The Shorebirds go for the sweep of the BlueClaws in the series finale on Sunday afternoon. Nick Vespi (1-0, 2.25) will make his long-awaited first start for Delmarva against Lakewood tandem Colton Eastman (0-1, 9.00) and Ethan Lindow. First pitch is set for 2:05 p.m. with gates opening at 1:00. Sunday is the first Perdue Strike Out Hunger Sunday of the season; two canned food items will get you a $3 Upper Reserved ticket, with everything collected going to local food banks. It's also another Hit the Books Game presented by Dr. Crouse at The Brace Place, plus a Kids Run the Bases game presented by Chili's. Pregame coverage on Fox Sports 960 AM and the MiLB First Pitch App beginning at 1:50 with Will DeBoer on the call.